F1 in Schools helps change perceptions of engineering, science, and technology by creating a fun and exciting learning environment. Autodesk is proud to be the Premium Global Software Partner for F1 in Schools and provide free* access to professional software and learning tools for the next generation of designers. F1 in Schools participants design and manufacture a C02-powered car, analyze aerodynamics, and create marketing material. Regional, national, and international teams are judged on car speed, design documentation, verbal presentation, and marketing display. See how these bright and determined girls are promoting STEM in their community, to other students, and ultimately, inspiring a generation. Watch this unique team shine and follow them as they make their way to the 2017 World Finals. Software is available for all competitors and educational institutions associated with F1 in Schools. Connect with students & educators from around the world who are passionate about F1 in Schools. 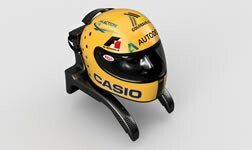 Design a concept Formula One race car helmet using Autodesk® Fusion 360. Search through the countries listed to find out more about how your team can participate locally. Design, analyze, and manufacture a racecar using these easy to follow tutorials. 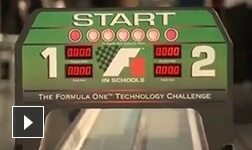 Check out videos and tutorials designed for F1 in Schools. Autodesk provides participants and academic institutions worldwide participating in F1 in Schools free* access to the same professional software used by industry leaders today. Learning resources, competitions, and programs from Autodesk provide added value for you and your students. Give your team professional design software from Autodesk and watch the magic unfold before your eyes. Autodesk provides free educational licenses for software to qualified educational institutions associated with F1 in Schools. To request free software for your educational institution, sign in or create an account. Find out more. 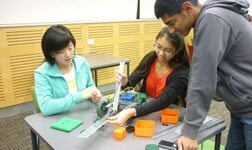 Student participants can download individual products to use for F1 in Schools right from this page. Below is the recommended software for this competition. Turn photos taken with your iPhone or iPad into 3D models. Design and share your electronics projects online. Convert 3D models into 2D build plans with animated assembly instruction. Sculpt with this digital sculpting and painting app. 3D modeling software for architects, designers, and civil engineers. Concrete design and detailing software. 3D modeling software for steel detailing. Automotive design, styling, and technical surfacing software. Industrial design tools for conceptual design and surface modeling. CAD design, drafting, modeling, and engineering software for the Mac. Extend AutoCAD software to a mobile device. The version of AutoCAD for architects. Software for civil engineering design, analysis, and simulation. AutoCAD software to design and document electrical controls systems. 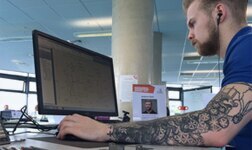 Design and drafting software for automating mechanical CAD tasks. Drafting/documenting tools for mechanical, electrical, and plumbing. AutoCAD software to design, model, and document process plants. Raster image editing and raster-to-vector conversion tools. Share, view & search 2D and 3D files in over 100 formats. Photorealistic and high-resolution image and panorama production. Access and explore models online or offline. Track project activities and collaborate on-site. Access project documents from anywhere. Create customized, rigged, and ready-to-animate 3D characters. Explore measurement concepts with interactive tools. Explore the principles of design. Sustainable building design analysis software. Wind-tunnel simulation software for airflow studies. Conceptualize early building design concepts digitally. Redesign your home in 3D, and find articles, designers, and more. The CAM solution for SolidWorks. 3D conceptual design software to communicate design proposals. View early concepts and alternatives from your iPad. Post your projects and learn from others. Integrated CAD/CAM solution to rapidly generate CNC machining toolpaths. A 3D animation tool for indie and mobile game developers. Create and collaborate on mechanical design mockups in real time. 3D character animation software for virtual production. Project review software for coordination, analysis, and communication. Apply more than 600 effects, overlays, borders, and edit any image. Create, export, or import coordinate data for construction field layout. Reality capture software and services for 3D documentation. 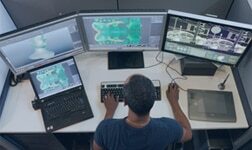 Visualize and organize reality capture data in a powerful preparation environment. Architectural design and documentation software for BIM. MEP design and documentation for BIM. Structural design and documentation software for BIM. Structural analysis for large, complex structures. Rendering software for 3D design. Fluid flow and thermal simulation tools. Create lighter, stronger, safer, and more efficient composite designs. Get rapid, detailed information on the behavior of composite materials. Fast, accurate, and flexible mechanical simulation tools. Plastic injection molding simulation software. Professional video editing and effects software for Mac. 3D character animation and visual effects software. Solve puzzles and create 3D contraptions on your iPhone. Go from mind to 3D Design and 3D print in minutes. Create CAD models for industrial design/engineering. Evaluate vehicle movements on transportation or site design projects. Use a library of VEX IQ parts to snap your robot parts together. Photorealistic 3D design rendering software. 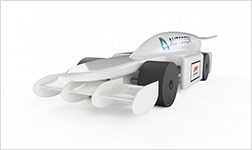 Learn how the Pink Quattro F1 in Schools team used Autodesk software to design their vehicle. Check out their story. Design an F1 car for manufacture using Autodesk Inventor®, 3D CAD software that allows you to design and simulate a design before it’s made. These tutorials provide step by step instruction for designing a F1 car in context of the model block. Download the following tutorials. Design an F1 car for manufacture using Autodesk Fusion 360®, the first 3D CAD, CAM, and CAE cloud based software that works on both Mac and PC. 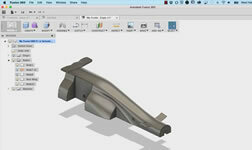 These tutorials provide step by step instruction for designing a F1 car by sculpting from the model block. Download the following tutorials. Apply the CAM toolpaths and the NC-code generated to send the car model to a CNC milling machine using Inventor HSM for manufacturing. These tutorials provide step by step instruction to prepare the model to cut, create the stock model, orient the model, pick the surfaces to cut, CAM and generate the toolpaths. Create the toolpath strategies to cut the car, and create the NC-Code to send to the machine. Apply the CAM toolpaths and the NC-code generated to send the car model to a CNC milling machine using Fusion 360 CAM for manufacturing. These tutorials provide step by step instruction to prepare the model to cut, create the stock model, orient the model, pick the surfaces to cut, CAM and generate the toolpaths. Create the toolpath strategies to cut the car, and create the NC-Code to send to the machine. Use Flow Design, a virtual wind tunnel, to visualize airflow around your F1 car to quickly gain insight on performance under a variety of conditions. Flow Design support various CAD files types making it easy to use. Learn how to quickly and easily transform your F1 car into photo-quality visuals using Showcase.